Opener Kusal Perera hit an explosive maiden half-century off 44 balls to steer Sri Lanka to a 17-run win over Bangladesh in a one-off Twenty20 international in Pallekele on Sunday. 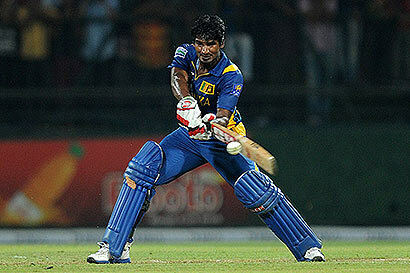 Sri Lanka, put into bat, rattled up 198 for five wickets with Perera hitting five fours and four sixes in his 64. Bangladesh finished on 181 for seven. Jeevan Mendis (37) and Thisara Perera (22 not out) provided the final flourish to the Lankan innings. Mendis and Angelo Mathews (30 not out) shared a stand of 66 off 35 balls to establish a new fifth-wicket record for Sri Lanka. Mohammad Ashraful provided Bangladesh with a solid start, racing to 43 off 27 balls including two sixes and four fours before he was cruelly given out lbw to a ball that was going down the leg side. Bangladesh kept their foot on the accelerator as contributions from skipper Mushfiqur Rahim (39), Mahmudullah (31) and Mominul Haque (26 not out) pushed them towards the Lankan total. But the loss of Mushfiqur and Mahmudullah off successive deliveries in the 15th over ended their chances of making a game of it.